3U PXIe industry physical format is ideal for use in today's fastest PXIe mainframe systems. 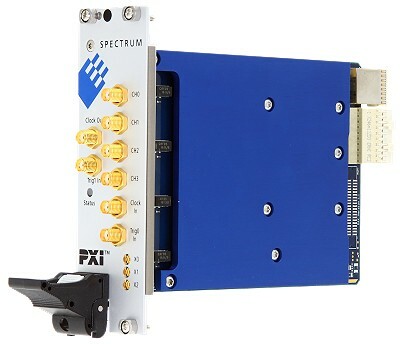 The M4x.66xx-x4 series arbitrary waveform generator (AWG) card modules use the robust industry standard PXIe interface, with x4-lane Gen2 ultra high-performance technology for signal upload from the computer in excess of 1.7 Gbytes/sec. The compact dual-width 3U module interface is designed for today's fast PXIe mainframe systems and fits PXIe and PXI hybrid slots Gen 1, 2 or 3. The combination of large on-board memory and ultra fast data transfer allows a short or long and complex signal to be generated, whichever is desired. The PXIe interface and the three-quarter length PCB are designed to be compatible to many computer and chassis combinations. The latest D/A converter design is utilised, providing up to 1.25 giga sample per second updates on the output channels. Updates are simultaneous and resolution high at 16 bits. This results in an exceptional combination of speed and resolution without the penalty of low signal amplitude. The output produces a maximum output swing of +/- 2.5 volts into 50 Ohms , +/- 5 volts into high impedance at 625 mega samples per second and only a little less at over a GHz! A software selectable 65Mhz -3bB bandwidth filter can be enabled through software command to smooth the output signal. Versatile triggering allows full control of signal generation periods. The trigger source can either of two front panel trigger inputs, any of eight PXI trigger lines, or the PXI star trigger. This ensures zero phase difference on signals produced across multiple D/A channels, or indeed multiple cards in the same PXIe chassis, utilising the chassis bus clock and trigger. Versatile Windows / Linux drivers provide a means of programming the AWG in text code, MATLAB, LabVIEW and LabWindowsCVI. Whilst the cards have been designed using the latest technology, they are still software compatible with the drivers from earlier Spectrum waveform generator cards. Hence existing customers can use the same software they developed for an earlier Spectrum AWG card, with the M4x version, using just a few code tweaks. Extensive support for text programming includes Visual C++, Borland C++, Gnu C++, LabVIEW, MATLAB, Visual Basic, VB.NET, C#, J# and Delphi code. Dedicated connection for external trigger input, programmable in 1 mV (analogue) steps.